The solution is to update the firmware using GoPro Studio. But you must have the camera on to do this. Most sailors have whisker poles to hold a jib out to weather. Not that many use them in racing as a spinnaker is the preferred sail for racing downwind. But not everyone wants to use a spinnaker and some of us race in classes that do not allow spinnakers. Over the years we on Papoose have tried to prefect using a whisker pole while racing. What I am about to discuss conflicts with the instructions you will find for using a whisker pole. The conventional methods assume you are not racing and are not helpful if you are. 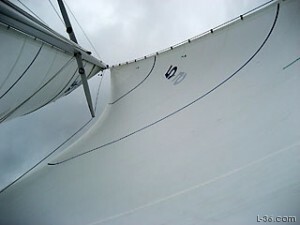 Cursers can furl the jib, set the pole, and then unfurl the jib to the pole. To remove the pole, they can furl the jib back up. A racer would not want to do this even if they could but there is no reason a cruiser has to either if you know some of the tricks discussed in this article. 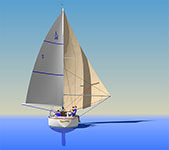 L-36.com is happy to announce that Bacon Sails is now listed in the Used Sails Search application. You can now search from the thousands of used sails that Bacon and other vendors, North, Minneys, Pineapple, have in stock. The inventory is updated every evening. Search results list just sails that stand a good chance of fitting your specific boat. L-36.com has listings for thousands of different boats listed by boat name. This is an excellent way to quickly see if any used sails are out there to improve your sailing experience. 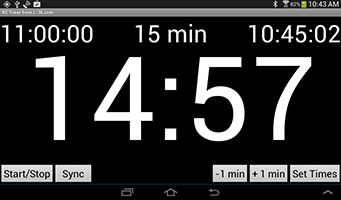 Race Committee Timer, RCTimer, is an Android application designed for race committees to do starts for sailing regattas. The timer can be set to a count down time, for example 5 minutes. It can also be set to a specific start time, for example 12:30. A sequence can be set so that multiple fleets can be timed in rotation, for example a start every 15 minutes. The timer can be started or stopped and minutes can be added. There is a reference page with signal flags and a lock button. The latest feature is that the app will now talk or sound a horn blast. Sounds can be programmed to occur at any count down time and anything can be said. A simple text file defines what is said or when the horns are sounded. The app is free. A version without sound is on the Google Play store under RCTimer. Yet another way to make a soft halyard shackle out of Amsteel. This is one that I am using on my boat. The advantage is that the hybrid knot gives approximately full line strength but only extends a couple of inches so that the short splice will not end up making the line that goes into the sheaves fatter. 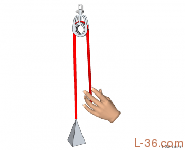 This prevents extra wear in thinner halyard sheaves. The knot provides the locking action which removes most of the load from the splice. The short bury distributes the load enough so that not all of the load in on the knot. The result has been tested to near full line strength. This knot is one of just a few that do not slip in Amsteel. The knot is strong and the splice prevents slippage. This is the first part of a two part tutorial on mechanical systems made from blocks and line. I will explore the mechanical advantage of various systems, and shows the general principles on how to set these systems up, including how to thread the line through the blocks, or reeve them. It will go from 1:1 to 6:1 with simple systems and up to 24:1 with cascaded systems. The second part will explore some more unusual systems. In honor of the April Fools prank by Sailing Anarchy, I am putting the Forum back online. Please feel free to post. There are two forums, one is a general topic and the other is dedicated to rope, splices, and soft shackles. This is the best place to get answers to your questions. The "Used Sails" tab has been improved. It includes a new vendor, Second Wind Sails, and is easier to use. If you have ever looked for used sails for your boat I think you will like what we have to offer. Find used sails that fit your boat from multiple vendors, North, Minney's, Pineapple, Beacon, and now Second Wind Sails. All presented in terms that relate to your boat. Just enter the brand of your boat, pick the specific boat from the list, and you will get a list of sails that will fit your boat. You can limit the results shown by filtering on sail type and, in the case of jibs, jib size. If you don't specify a sail type, all types are displayed. Previously, nothing was displayed and that was confusing some people. We filter the vendor results eliminating sails that we know will not fit. 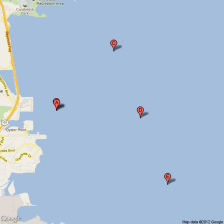 Regular readers of L-36.com know that I am writing an Android application for racing sailboats. I have had the pleasure this winter of collaborating with a Dutch sailor who is practicing this winter in hopes of winning his class in a major regatta this summer. With their 9th place finish two years ago and their 4th place last summer, we believe it is within reach. This article is an analysis of a single tack. It uses GPS tracking data to calculate the current and from that to calculate the expected tacking angle. The upwind leg is the leg of interest. We are analyzing the third from the last tack before the mark rounding. We want to know why the boat was not able to make the mark without the last two tacks. The ultimate goal is to come up with better on the water tools for calculating laylines when there is current. Do you ever wonder what the big difference is between the boats that consistently finish in the front of the fleet and the boats that don't? Sure, sometimes it is just one or two big things; maybe a brand new set of sails while your struggle along with sails 5 or 6 years old, or maybe you think they have some uncanny way of always being on the correct side of the next shift. But after years of racing in all kinds of fleets I can tell you without a doubt that 95% of the time it is nothing so simple but yet something that can be easily attained. The magic factor is really a combination of a whole lot of small things that add up to a big difference and a big winning percentage. This bend has been tested. Sometimes it slips, sometimes it breaks. Either way it is stronger than a triple fisherman's. Amsteel is very slippery. It is difficult to test a knot that slips and even harder when it slips sometimes. If you pull and let it sit after it starts to slip, it recovers and ends up being strong, something above 40% of line strength by some tests. There are other knots that almost never slip, see the Last Bend but it is ugly and not near as simple or easy to tie as this knot. The standard for tying Amsteel or Dyneema together is the triple fisherman's knot. This knot slips less that a triple fisherman's so it is a step forward slipping or not. When it doesn't slip, it is stronger than the Last Bend. I present it here for your consideration. Both the First Knot and the Last Bend can slip at about 35% of line strength. When they don't slip, they are about 40% of line strength with the First Knot just a little above this and the Last Bend below this. There is another variation that slips at about 40% that I will show here as well. You can untie the First Knot, but not the variation. This knot can also be untied even after being loaded up near breaking. Just put a spike through the center to loosen it up and remove the tails from the knot center. The rest is easy. I am calling this knot the First Bend because by the time I was done testing dozens of variations on knots and never wanted to hear the word bend again, I called the final knot the Last Bend. It did well but upon considering this knot, the first one I considered, I came to appreciate it more. In fact, I am declaring it the winner of my search for the best bend for Dyneema. That said, the variation is stronger. Are you still using an old worn out knife? When I found it time for a new knife, I was amazed how much knives have changed. I recently purchased about half a dozen new knives as I explored the field adding to the way too many knives I already had. I scored the Internet for recommendations. I read reviews on Amazon. I tried knives at the local WestMarine (none were acceptable). In the end there were 5 knives I liked and would recommend. There are also whole classes of knives I would stay away from. This article will take you through the thought process and hopefully help you find the perfect knife for your application. The set of tools that will generate a GPX file for your GPS has been recently fixed and I thought it time to make people aware of this valuable tool again. With two map clicks you can get a list of all the marks in that area, select the ones you are interested in, edit their names, and download a GPX file to your computer. These are USCG generated locations from the many volumes for all US territories. The search through all the volumes is done automatically. In just a couple of minutes, you can do what might take an hour to do previously. Please enjoy these tools.